Earlier today, I reported on the news that the NSA (National Security Agency) has been receiving daily logs of millions of Americans from Verizon. 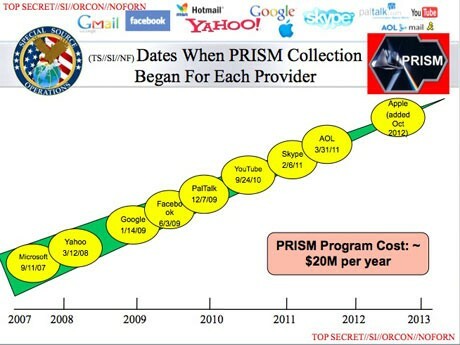 Now, the same UK newspaper, The Guardian, is reporting about a program the NSA has had in place since 2007, called PRISM. The Guardian claims they have verified the authenticity of the document, which is marked as a Top Secret, 41-slide PowerPoint presentation. The document states that in 2007 Microsoft was the first to participate. Yahoo joined in 2008. Others followed in quick succession: Google in 2009, then AOL, Apple, Facebook, PalTalk, Skype, and YouTube in October 2012. The amount of data the NSA can access includes email, video and voice chat, videos, photos, voice-over-IP (Skype, for example) chats, file transfers, social networking details, and more. The NSA can reportedly tapped into the servers of the providers themselves—with or without their knowledge if this report is true. 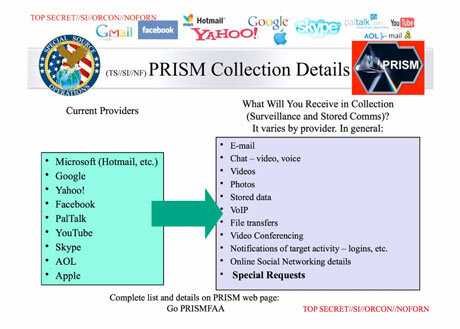 Microsoft, Google, Facebook, and Apple have all denied participating in PRISM, but according to the report, the NSA might have had access to their servers without their knowledge, or this report is not true. Either way, it is very scary knowing how much Big Brother can be watching your every move without you knowing!